If you’re building a mobile app, it should simple enough for a drunk person to use. Believe it or not, that’s actually not a bad philosophy. Indeed, Drunk User Testing can show you how a website might look under the influence. And over at The User is Drunk, you can pay to get your website reviewed by someone who’s ‘very drunk’. Well, it’s one way to make a bit of cash. Of course, some apps have to consider users who really might be drunk. On Friday and Saturday evenings in London, I reckon a significant proportion of Citymapper and Uber users will have had a shandy or three. And if you’re creating an app for a beer festival, of course there will be alcohol involved during the user journey. 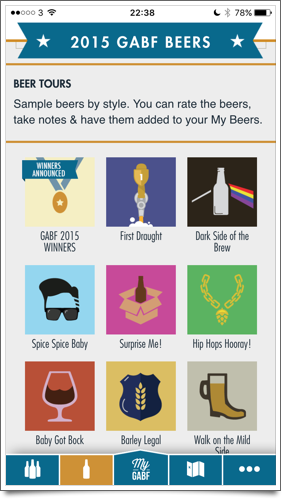 Step forward My GABF, a mobile app designed to accompany the Great American Beer Festival. This annual celebration of beer from the USA takes place in Denver. I visited in September and it’s enormous. With 3,500 beers available from 750 breweries, you can only sample a fraction of what’s on offer. 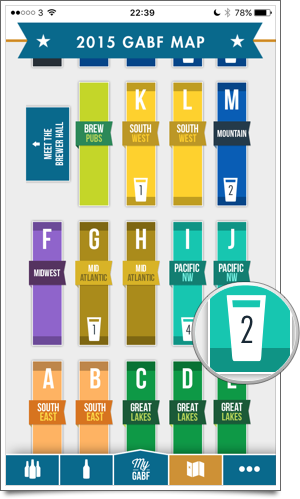 The My GABF app aims to help you navigate this rich choice of beer. And it does an excellent job. 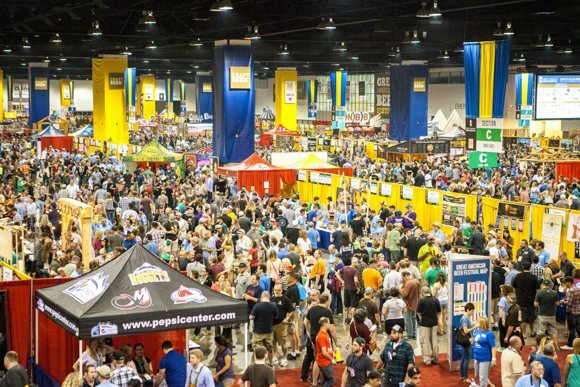 What makes My GABF so good? On the face of it, My GABF offers exactly the features you’d expect from an event app. There’s a list of beers and breweries. There’s a map. And there’s a section to keep you up-to-date with festival news, like which beers have won awards. Although the features have clearly been thought through, it’s the genuinely simple, intuitive experience that makes this app stand out. Quite simply, My GABF makes it easy to get the information you need: before, during and after the event. To minimise clutter, less-important options — such as news — are hidden in a separate section. My GABF maintains its focus throughout, with screens that are universally uncluttered and easy to understand. But ultimately, the Great American Beer Festival is about discovering new beers. The app mirrors this by giving you several ways to explore what’s on offer. 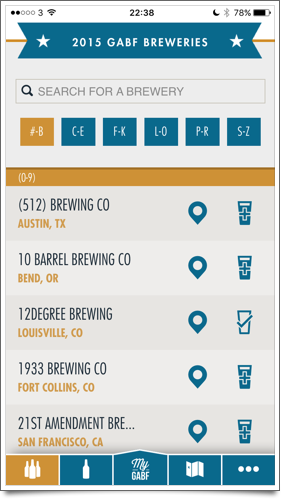 When viewing the full list of breweries, you can choose which to add to your shortlist by tapping the glass icon. Or tap the brewery name to choose from the available beers. 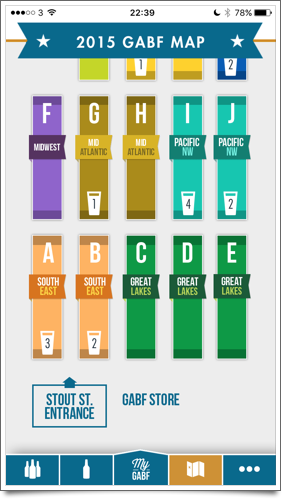 The app provides a bunch of ‘beer tours’ that group similar drinks. So if you’re a fan of double-hopped or sour beers, you can track them down more easily. You can explore the festival map, tapping each sections of the floor plan to reveal the breweries there. This means you can quickly find out what’s around you at any time. You can also search for specific beer names, or simply scroll through the list of beers looking for ones that sound interesting. There’s one other way in which My GABF works hard to keep you coming back to the app. As you explore breweries and beers in advance of the festival, you can select the ones you’re interested in, building up a list. At the festival, the app helps you try as many of those beers as possible. It does this by flagging the beers on your list in context. Just tap ‘My GABF’ and you see a full list of your beers and breweries. To make sure you can actually find each beer in the sprawling festival venue, you can jump straight to its location on the map. You also see your shortlisted beers highlighted within the beer tours. If you connect My GABF to Facebook, the app saves your shortlist and tasting notes online. This means they’ll be safe even if you lose your phone or uninstall the app. But once the initial list of breweries and beers has been downloaded, this app doesn’t need a reliable data connection. That’s really important, because it’s hard to guarantee a good connection in a busy venue. What’s more, My GABF responds just as quickly no matter if the connection is fast, slow, or non-existent. In other words: as long as your battery isn’t flat, it’ll work. 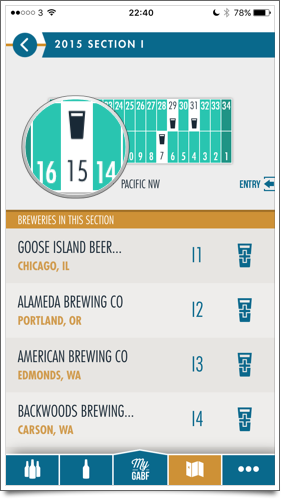 A focused app, with exceptionally clear navigation and several logical ways to discover new beers. Straightforward personalisation, so it’s easy to save and view the things that are important to you. Guaranteed reliability, which means you can always use the app even if your data connection is flaky. 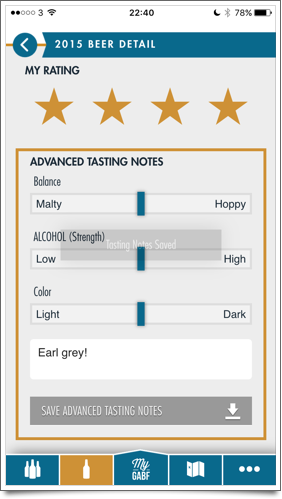 Oh, and did I mention you can enter your own tasting notes, then save for future reference or even export as a CSV file? See, I told you it was good. Genuinely one of the best apps I’ve discovered this year. And not just because it’s about beer.